Centurywise CW6 aluminium cleaner is specifically designed for the cleaning and polishing of aluminium fabrications and lorry tipper bodies which tend to become dull, corroded and pitted in service. This product contains no abrasives, and when correctly used will not affect paintwork. Dilute well before use , rates as below. Low pressure spray or brush onto surface, starting at the bottom and working upwards. Agitate and brush out evenly. Rinse off with plenty of water,preferably a pressure washer. NB. 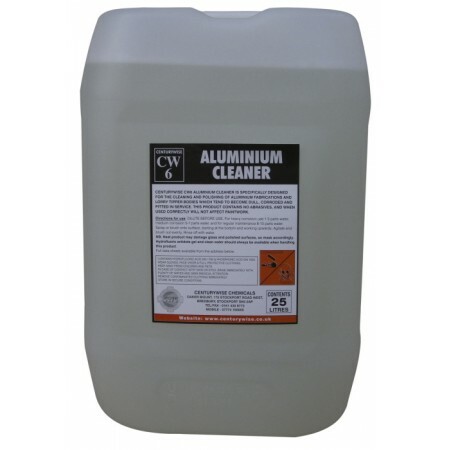 Neat product may damage glass and polished surfaces - mask where necessary with plastic sheeting. CW6 contains hydrofluoric acid and phosphoric acid. Wear suitable gloves, eye/face protection and full protective clothing. Hydrofluoric antidote gel and clean water should always be available when handling this product.